Although I only had a four day work week since my parents were in town, as soon as I got back to work on Tuesday, there was so much to be done! Linking up for Five on Friday with Christina, April, Darci, and Natasha! Finally!!! It is grilling weather! Is it just me, or does everything taste better grilled? This week John and I had grilled chicken two nights and grilled brats another... They were fabulous! Please tell me that someone else is equally excited about this!! I meant to take a picture of our yummy grilled chicken but we ate it too fast! Need a veggie to go with your grilled meat? Try this recipe for cauliflower cheese sticks... So good! 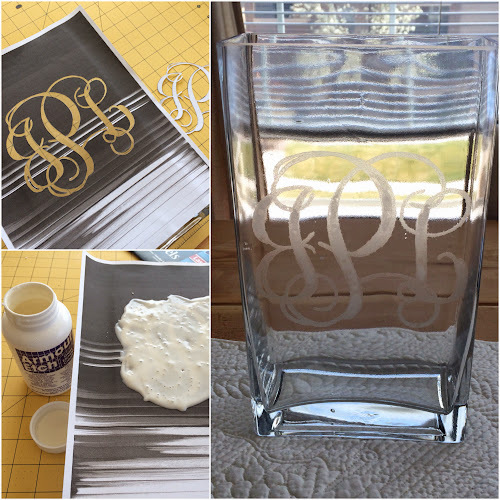 I have been wanting to etch a monogram on glass for a while, and I finally found an online monogram generator that I loved! And it's free!! I began by printing the monogram out on an 8x11.5 sticky label. I then used an x-acto knife to cut out the monogram (in our case, JPL) and stuck the label to the piece of glass that I wanted to etch. Then I used an etching cream over the exposed areas to etch the monogram. Leave the etching cream on for 30 minutes and then rinse. 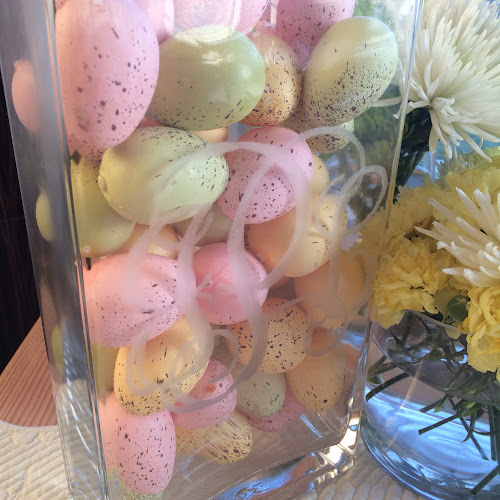 I decided to put some faux eggs in the vase. It is hard to see the etched monogram in the picture, but it in person it is the perfect amount of noticeable (not gaudy, but definitely visible!). I'm not much of a breakfast girl... I know, I know, "breakfast is the most important meal," but I never am hungry, and quite frankly, I just don't usually have time! On Pinterest (where else, right? ), I came across Greek yogurt covered blueberries, and it seemed like the perfect grab-and-go breakfast! Begin by covering your blueberries (I also used raspberries!) in Greek Yogurt and place on wax paper. 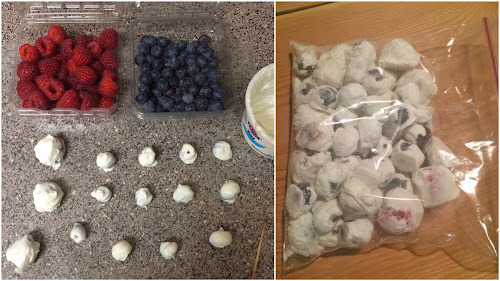 After you cover all of your berries, put in the freezer for an hour. Once your berries are frozen, put them in a ziplock baggy and leave them frozen until you're ready to eat. They take a few minutes to soften up, but are great to just grab a few here and there when you're looking for something to hold you over! Dress Up Your Cup & Starbucks giveaway! Need to start your Friday morning with a drink from Starbucks? Yes, please!! I'm co-hosting a giveaway with some lovely ladies for $20 at Dress Up Your Cup (check out this Etsy shop... too cute!!) and $30 of Starbucks! Girlll, that's like 5 venti chais... you need this. Oh girl I love the DIY monogram!!! Thanks for sharing that - have the perfect vase to try it on!! Hope you have a great weekend! Those cauliflower cheese sticks look so good! I will definitely be trying those! 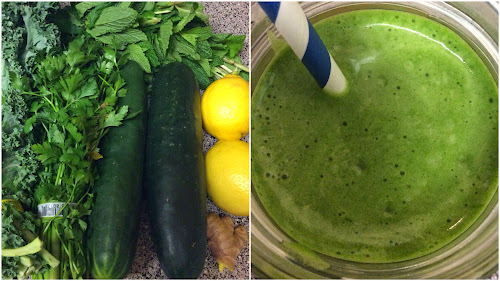 Do you use a juicer or a blender? The hubs and I have wanted one but not really sure what to get. Any recommendations? We grill all year long, even when there's a foot of snow on the ground! We have a little covered porch on the back of our house where we jeep our grill so were able to use it all year. Love anything on the grill!! Happy weekend!! I just started doing that berry thing too with the yogurt! So easy! I have been meaning to do that greek yogurt and fruit thing forever!!! I need to get on it! Totally love those cauliflower cheese sticks and that juice! Must make that juice this weekend!! Have a great weekend Lisa!! Those cheesy cauliflower sticks look yummy! And I'm intrigued by juicing. What kind of juicer do you have? Have a great weekend Lisa! Lisa! I am OBSESSED with that glass etching! I am going to have to try that! Great job! "Girrrl that's like five venti chias" BAH HA HA HA HA! Love it! Thanks for taking part in this! That glass monogram is awesome! You're so crafty! Love the etched glass vase! You are so crafty! YES to grilling weather! I didn't grill last night, but I enjoyed sitting outside on the deck without getting chilly and it was amazing! And you are so crafty -- loving all of your DIYs! Oh my goodness! How cute is your monogram vase! I love it! Can't wait to give it a try! :) Hope your day is great girl! Girl you are KILLING me with these awesome, yummy creations! Love those Greek yogurt covered blueberries!! :D Happy Friday!!! i totally need to try those cheese sticks! yummmm! ummm fabulous post all around girl!! Everything you make looks fabulous and makes me hungry and I am swooning over that monogram and must create myself!! Happy weekend lady!! You are really good at coming up with these crafts. So, I don't usually like to make gifts to give because I have no time and they aren't always something people will really appreciate but the etched vase IS GOLD IN MY BOOK. Kudos to you!!! I bookmarked those cauliflower cheese sticks. Can't wait to try them! I love your Easter decor too! So much goodness in this post! I agree everything does taste better grilled! Definitely one of my favorite things about spring/summer! I love how the monogram turned out- the colored eggs look perfect in the vase with it! Those yogurt covered berries look delicious as well! Such a great idea! You're killing me with all these healthy snacks!! I've got to implement these! Great giveaway hun! Your juices always look amazing--what juicer do you use? Yogurt covered fruit? Um YES! Love the etched glass vase! So cute and looks very simple to do! I'm not a breakfast person myself but the berries look yummy :-) Happy Weekend! You're a girl after my own heart! GREEN juice, yogurt covered berries, cauliflower cheese sticks! Yes, please. Hope you have a wonderful weekend. I’m so glad you shared the printable monogram! I’m going to save that and try it out soon! I'm always looking for some better, healthy snacks & those berries look great! Those berries!!!!!! I'm so doing this. And the cauliflower cheese sticks! YUM!!! Grilling weather is my absolute favorite because it means I can finally turn over some of the cooking duties to my husband! It's not quite that nice out around here yet (and we have a rainy weekend looming) but soon enough I hope! 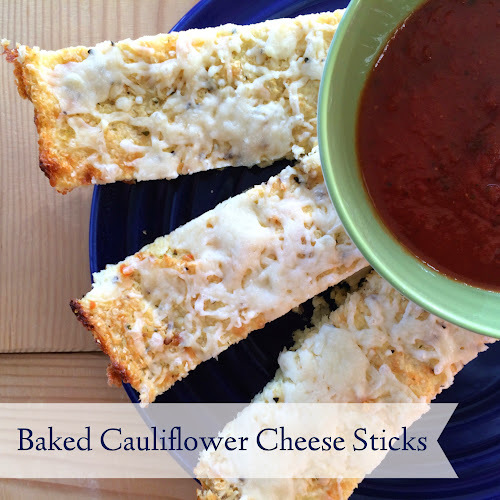 Also I've got to try those cauliflower cheese sticks, they look delicious! HOW are you so crafty??!! I wish we lived closer so you could teach me your ways!! Such a cute vase, girl!! Oh that monogram is awesome! I don't think I have enough patience or the steadiness of hands to xacto something like that. I can barely do a clover. Thats like three humps and stump...not curlicues! Turned out great though! Love the berries idea, I know Aria would be thrilled. i love being able to grill and then enjoy what we grilled by sitting outside, love love those nights! Amen to the grilling! Although I don't get to enjoy it quite as often as I would like considering I don't know how to use the grill and the hubs is always gone at work during the week. Haha :) I love your etched glass! I did a lot of etching for our wedding last year! I was surprised how it turned out! Those berries dipped in greek yogurt sound yummy! Did you just use a plain vanilla greek yogurt? !